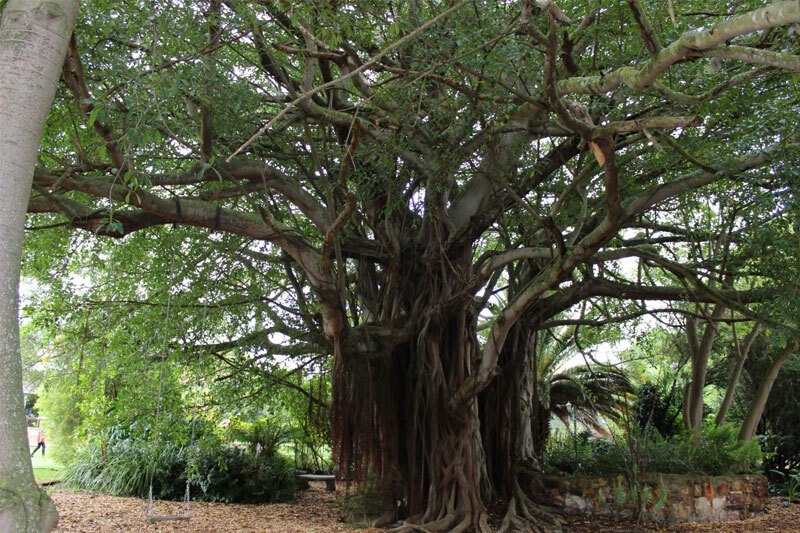 The Department of Water Affairs and Forestry (DWAF) initiated a project to identify and protect trees worthy of special protection throughout South Africa. Such projects have been established in several countries, but this is the first of its kind in Africa. Champion trees are trees of exceptional importance that deserves national protection because of their remarkable size, age, aesthetic, cultural, historic or tourism value. Voëlroepersfontein Guesthouse and Writer’s retreat, in the Heart of Albertinia, situated in George street, have recently been awarded this status for one of the two old Ficus burkei (Wild Fig) trees situated on the property, as there is only 86 Nominated Champion Trees in SA, this award is a very exceptional one. The “Whispering Tree as it has been dubbed is also one of the ten thickest trees in SA, making this is a must see and experience in Albertinia. Voëlroepersfontein is a place of rejuvenation and inspiration, where you reconnect with nature and – enveloped in the shade of the century old Ficus burkei – experience something of your own place in the universe, in harmony with Albertinia’s tourism theme of “Healing through Nature”. *“Voëlroepersfontein” loosely translated means the place with fountains where birdcalls abound.